MEGADETH bassist David Ellefson, who launched a boutique coffee brand called Ellefson Coffee Co. a few years ago, was asked in a recent interview with Wasted Attention how he likes to drink his coffee. "I've just kind of changed it [over the years]," he said (hear audio below). "At 54, I'm always keeping track of my health and working out and diet and everything else. I've modified it a bit. I stopped putting the cream in my coffee. I try not to use any artificial sweeteners and artificial creamers and things like that. I'm just doing black coffee with two ice cubes in it… That's one way that I like to do it. And one of the things I found doing that, and I kind of learned this as we were doing it, it's called cupping. In wine, you do the wine-tasting thing. In coffee, coffee tasting is called cupping, where you sort of put the cups of coffee next to each other and you sample their flavor profiles. And it's interesting how coffee can really change. Adding even just an ice cube or two changes it a little bit, and certainly adding sugars and honey, and adding milk and cream and things like that. It really changes the profile of a coffee. And sometimes coffee that doesn't taste so good with no cream tastes amazing with cream. And all of a sudden, you can start pairing it up with desserts and different things, or breakfast food items. And other coffees just have a natural nice taste to it, just plain, without anything in it. So I've learned to probably be a little more aware of that stuff now that I'm dealing in the coffee business myself. So more and more, I think I like to just let the natural flavors of the coffee come out without putting something over top of it." In early 2017, David opened the first brick-and-mortar Ellefson Coffee Co. shop in his former hometown of Jackson, Minnesota. He befriended a local coffee shop owner and worked with her to create a signature blend dubbed Urban Legend. His line now features five different selections, including Roast In Peace and Kenya Thrash. The brick-and-mortar shop in Jackson has since permanently closed. According to Thom Hazaert, Ellefson's business partner, the Urban Legend blend is inspired by the MEGADETH song "Mary Jane", which was based on an urban legend surrounding a 19th Century Jackson witch. "One time when I was in Jackson, we even went Loon Lake cemetery to visit Mary Jane's grave with a paranormal investigator," Hazaert said. Ellefson explained his relationship with coffee and mission on the Ellefson Coffee Co. web site. "My love for coffee has accompanied me around the world for my entire musical career," he said. "Just like the spirit of a culture or the melody of a song, the enjoyment of coffee brings people together and creates harmony among us. The beans in this bag are traceable to their global origin and exemplify the spirit and culture of the people who grew them. It is my aim to bring this roast to our tables and awake our taste buds, fire up our rock n roll spirits and continue the global fellowship of music, art and coffee. May you Roast In Peace!" 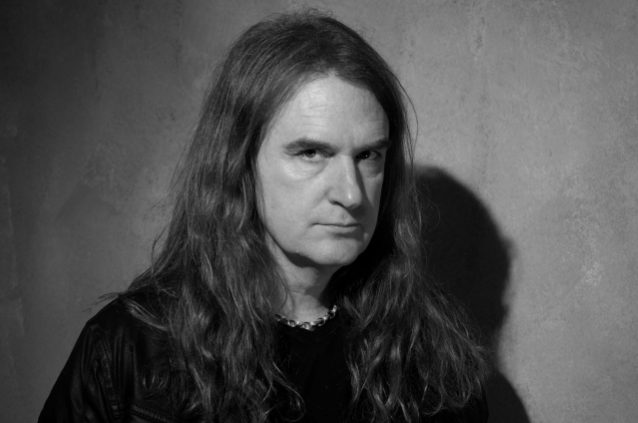 Ellefson grew up on a farm in Jackson but has lived in Scottsdale, Arizona since 1994.